Well, from one or two sources I've read after the fact, this was actually a somewhat rare convergence. IE, the volcano happened to erupt just as an electrical storm was passing overhead. IE, rather than erupting into a clear blue sky, it was erupting into a lightning storm. It just made for a heck of a mashup! Probably didn't hurt that the volcanic plume may have spewed a bunch of charged material in addition to any neutrals (ash & whatnot). I think that was the gist of it anyway? Hey Micheal, thanks for the reply. I've been looking through this gallery and the daytime images seem to show the volcano erupting into fairly clear skies. I would expect this type of electrical storm to kick off once the eruptive column punched through the bottom of the stratosphere. Also, if you look at image 13 in the gallery above, you can see the green lightning bolt that I alluded to earlier...it may just be the same bolt from a different angle but the scene looks different. I can't remember seeing a green bolt of lightning before, would the colour of the bolt have any significance? Well, one of the article I had read had talked about it being a coincidental alignment. But it was a little while ago, so I don't recall the exact details. But I seem to recall them saying either that the storm was over it when it started erupting, or that the storm migrated / moved into the area at some point while it was erupting. But, again, I don't recall the precise specifics of the article. Well, there are a few articles that allude to both the volcano erupting and an electrical storm. So, which came first, the volcano or the lightning storm & are they related events, or just a happy convergence? - NOW SEE THIS: http://www.visualizationsoftware.com/3dem.html! - One of our new members, Vincent Wee-Foo, has a website about his theory of vortexes. When perusing his site recently, I found there a remarkable image of underwater mounds on Earth having many flat-bottomed shallow "craters" very similar to those on Mars' Olympus Mons "volcano". 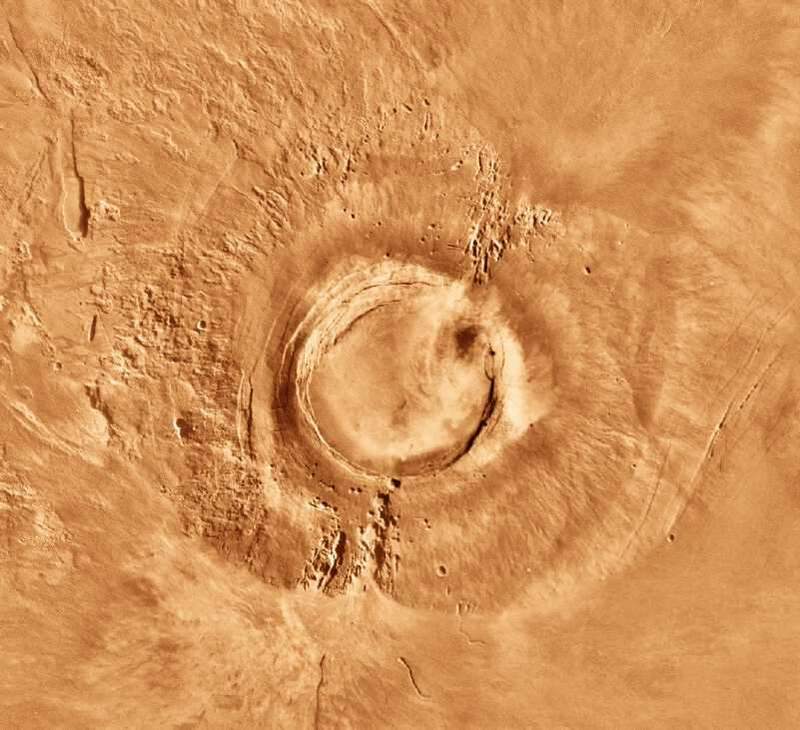 This is the first phenomenon I've seen anywhere that looks a lot like Olympus Mons. This image [above] of the 3 underwater volcano-like mounds is titled "Northeast Pacific Ocean Ridge" and is said to be "From NSF RIDGE Project CDF Bathymetric Data", as shown at the bottom of this series of images: http://www.visualizationsoftware.com/3dem/gallery.html. - NSF stands for National Science Foundation. RIDGE is also an acronym, referring to a project about 8 years ago to image ocean ridge features. The NE Pacific ridge is off the west coast of North America. It seems that several west coast universities were in charge of the project. At least one of them in Oregon has an ocean research vessel, which was likely used for the project. - What we need is for someone to find out who would have more data on the above mounds and more images to look at from the RIDGE project etc, which may provide further useful details. The exact location of the above mounds would be the first thing we'd want to know. The 2nd would be close-up images and data for the mounds. The 3rd would be images and data for other parts of the ridge system. - Here are images of Olympus and Arsia Mons for comparison. Last edited by nick c on Mon Mar 28, 2011 11:29 am, edited 1 time in total. Well, if we're looking for NSF RIDGE data, why not Google NSF RIDGE? Not sure if that gets us 100% of the way to where we'd like to be. But, it can't hurt, right? I agree with the comparison to Olympus Mons. I came up with Vance Ridge off the coast of Oregon/Washington. This link: http://www.marine-geo.org/portals/seismic/ is to a viewer similar to Google Maps (it is powered by Google) with the typical Google Maps controls. There is also a wealth of information on that site. They also offer the GeoMapApp and VirtualOceans (Java downloads) which are stand alone alone programs which integrate with each other as well as with NASA's WorldWind(?) app. There's so much data it's almost overwhelming. They also took magnetometer readings (integrated data for the apps). Sorry! I haven't explored it enough to offer Mercator coordinates for Vance Ridge but play with the map and you'll find it quickly. Hmm, off the coast of central oregon, I see President Jackson Seamount. Though I'm pretty sure it's not exactly the same. Vance Seamount, on the other hand a bit NW of President Jackson Seamount seems to be a pretty good match. Now that we've got a name, Vance Ridge Seamounts, the rest falls into place. - Thanks, folks, for finding all that. Ain't the internet great? I know that there was some thread about Electric Universe`s part in Volcanism, but I don`t seem to be able to find it. This is a very beautiful image of the May 2. eruption of chile`s Chaitin volcano. I first saw it a few issues back in New Scientist and now it`s in National Geographic`s november issue. I think it`s a really amazing photograph!